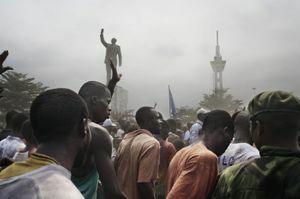 Pieter Hugo, Untitled, Agbogbloshie Market, Accra, Ghana, 2010. ©Pieter Hugo, Courtesy Priska Pasquer, Cologne. The exhibition ›Evoking Reality‹ elaborates the evocative potential in artistic works that contrast explicit openness, ambiguity and dissonance with the neutrality topos of the documentary and thus allow an individual constitution of reality. Photography and video are examined for their limits and possibilities, their social functions and meanings, and in particular for conventions of representation and their instrumentalization in cultural, political and economic mechanisms and power dynamics. It is not only the fields of individual and collective conflict dimensions that unify the exhibition's works, but rather the complex, implicit relationship between form and content.